By Randy Spencer – The 2017 race season officially came to a close this past Saturday night (February 3rd) as Flamboro Speedway held its 57th annual awards banquet at the Waterdown Legion. 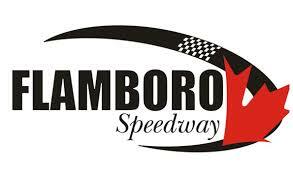 The sixth annual Flamboro Stadium and Speedway Hall of Fame banquet was also a part of the show. The night got underway with a meeting of a full house for cocktails and a great meal followed. The Hall of Fame banquet portion of the nights festivities was up first. Yours truly gave a speech and Master of Ceremonies Gary Colling read a story of each inductee and each came to the front to receive their award. This years inductees were Dave Burbridge, Bernie Campbell, Gene Karley, Bob Kurtin, Linda Stenhouse and Don Thomson Sr. I also announce that we are forming a Hall of Fame committee to discuss everything related to the Hall of Fame, nominations, selections to the ballot and how this will be done, voting procedures, qualifications that need to met etc. This will lend some new ideas and will make the hall of fame more reputable and creditable. Larissa and I will be joined on the committee by the following. John and Frank Casale, Brenda Shunamon, Gary Colling, Mike Schmidt and Adam Ross. The remaining are already members of the Hall of Fame. They include Gary Elliott, Bill Grisdale, Harry Nicholson, Dave Burbridge, Wayne Keeling, Dave Franks and Randy Slack. The track awards were next up. Once again Frank and Frankie Casale did an amazing job on the trophies. Gary Colling read off the awards and Brenda Shunamon and Doug Leonard hand out trophies along with reps from the track and division sponsors. Thanks to John and Frank Casale for another great year. Congratulations to all, especially the points champions. Nice to see three first time champs, Nick Troback, Doug Moir and Dan Nanticoke, a four time champ Russ Aicken and five time champ Shawn Chenoweth. The 2018 schedule has been released, copies were available at the banquet and will be at the registration. It is also on the website. Practice day is April 21st with regular racing starting April 28th. Check the website for all the details of the schedule and so much more.